SUMMARY: What IS it about me and getting up early on weekends? Woe and alas! Ye sad agility addicts like myself, who are all too familiar with rising at 4 a.m. on weekends and have miles to go without your sleep, yes miles to go without your sleep, to do something active and competitive. I've been doing this since 1996. Sometimes 20 weekends a year. I gave up a perfectly happy life in which I got plenty of weekend sleepage. But it wasn't always like that. After graduation, I briefly enjoyed sleepage on weekends (with a brief stint on UCLA's speech & debate club, where I did well enough, but then apparently decided that I'd had enough of giving up my weekends). But I couldn't let that rest (so to speak): Had to find some other stupid way to get up early and do things on Saturdays that I'd have done much better if preceded by appropriate ZZZZZZZs. 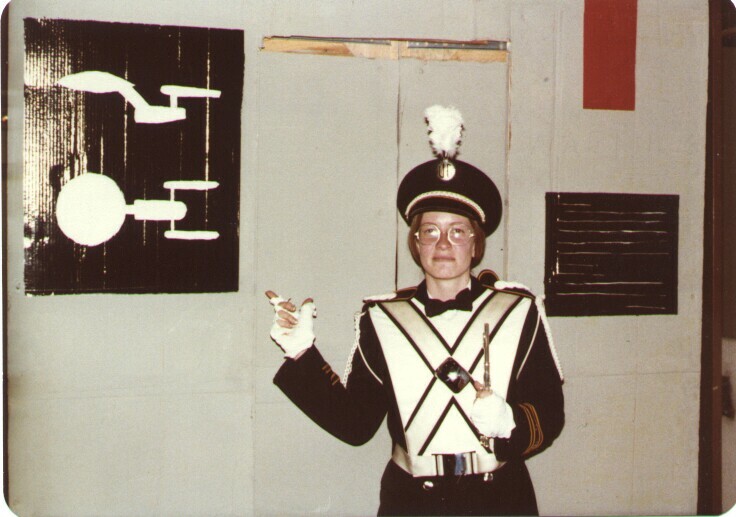 So, my junior year at Cal, I joined the Cal Band. I loved it. The exercise, both mental and physical, was phenomenal. But, guess what: On game days (don't recall exactly--maybe 10x during the year? ), we had to be out on the practice field at the far end of campus by some ungodly hour of near-darkness for last-minute warm-ups and practice, sweating in most of our thick black wool uniforms. Then we'd march allll the way up the hill and across the campus to the stadium, then did the pregame show, and so on and so on, all with a totally inappropriate amount of sleepage (you ever live in a campus dorm? On a Friday night? Like, trying to go to bed at 9 p.m.?). Then, finally, I had almost 20 years of not having to get up on weekends, except that the dogs usually thought that wasting daylight was a sin, and except for the occasional "hey! Let's get up at 4 a.m. and drive to Yosemite for the day!" sorts of idiocies, like I really missed getting up at 0-dark-thirty. But wait--apparently that life was too good for me. So now, here I am, doing the stupid early rising thing every other weekend or so. What great pictures! Everyone should have to post pictures from their child- and early adulthood! I ran track and cross country in high school and also had to get up early on weekends. Maybe it is some kind of sickness we carry into our adult lives. Coincidentally I was going through some old pictures the other day and found my high school prom pictures. Long pink floor length dress. What else can you do but laugh?